Donkey Kong swings into Mario + Rabbids Kingdom Battle this June in an all-new adventure. Nintendo's best dressed Ape will contend with an unexpected visit from an angry Rabbid Kong and his sinister cohorts, but fortunately, he’ll have the help of Rabbid Peach and Rabbid Cranky – a hybrid of a Rabbid and the eldest "get off my lawn" member of the Kong crew. 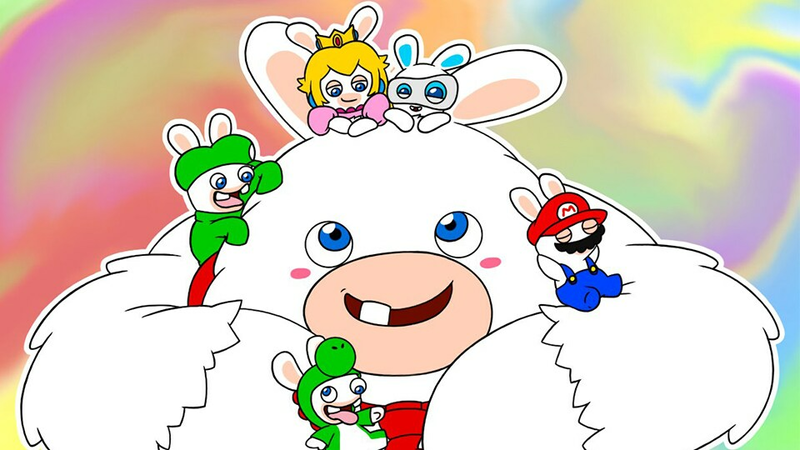 The introduction of DK and Rabbid Cranky isn't the only reason to get excited about the challenges that await in this unlikely crossover. We've got six other reasons why you'll want to jump back in for some strategic banana-throwing action. The environments in Mario + Rabbids Donkey Kong Adventure aren't the same as those found in the original game. 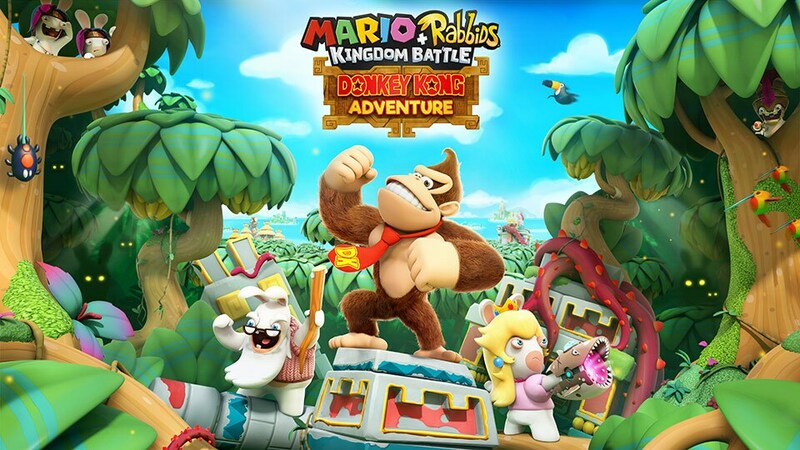 After all, the original takes place in the Mushroom Kingdom, whereas this takes place in a Rabbid-fied version of Donkey Kong… country, in which you'll find four different-themed zones – Lagoon, Reef, Jungle, and a yet-to-be-identified area that the team is keeping under wraps for now. The team estimates there's about 10 hours or so of content spread across these new areas, so there will be plenty of Rabbids to fight, puzzles to solve, and secrets to investigate. 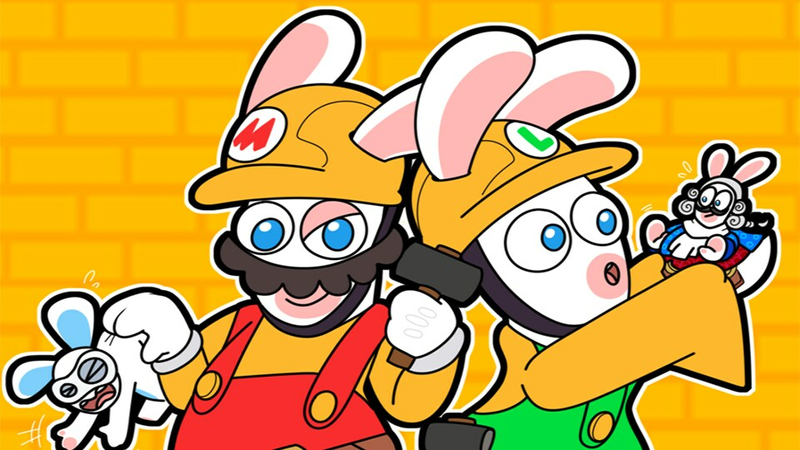 We already mentioned the addition of Donkey Kong and Rabbid Cranky to the mix, and while it's incredible to see the two in the Mario + Rabbids universe, it's their skills and abilities that truly make them shine. Let's start with the most famous ape, Donkey Kong. He comes equipped with the Bwananarang as a primary attack, capable of hitting multiple enemies in a single toss, as well as his trademark DK ground pound, which can do serious damage to enemies in close range. Naturally, his two abilities are tied to his primary and secondary attacks. Similar to Mario's Hero Sight or Luigi's Steely Stare, Hairy Eye makes DK target and attack any enemy that moves within range of his Bwananarang. Meanwhile, Magnet Groove gets DK to bust out his bongos to lure enemies in closer for a ground pound, or out from of cover so he can get a clear shot. Rabbid Cranky might not look like much, wearing your grandpa's favorite sweater and brandishing his cane cantankerously, but his attacks and skills are a force to be reckoned with. In fact, that's no ordinary cane he's holding; it's the Boombow, and it packs a serious punch as a close-range, wide-spread weapon. What it lacks in distance is made up for by Rabbid Cranky's Barrel Bolt, which can lob a single shot into a general area at distance, and even over cover, to damage multiple enemies thanks to its Area of Damage bonus. Still, you won't have to get Rabbid Cranky close to enemies to give his attacks the most impact. His Long Story skill puts enemies within range to sleep, allowing him to get the jump on them. Likewise, if an enemy tries to get the drop on him and they're in range, Rabbid Cranky's Stink Eye skill will give them a blast of the Boombow on the way to their destination. 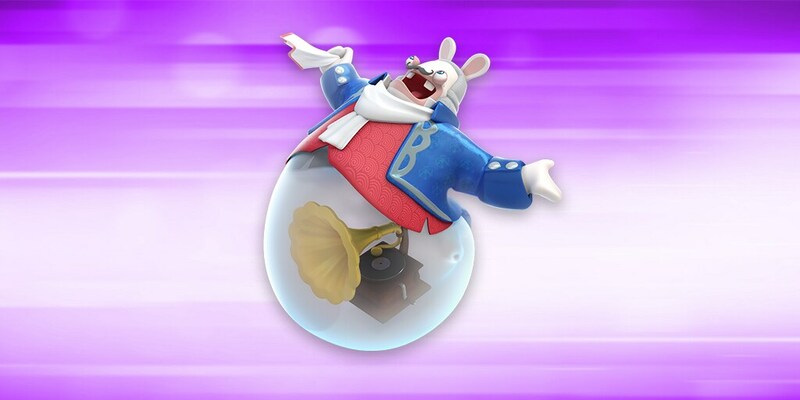 Lastly, Rabbid Cranky comes with a completely unique ability – any time he performs a team jump in range of an enemy, he can rain down Boombow blasts from above. Rounding out the trio, Rabbid Peach carries over her blaster and sentry from Mario + Rabbids, but like the Kongs, she'll have access to an entirely new arsenal of goodies (complete with hilarious new descriptions) in the Battle HQ. Additionally, her shield and healing skills can complement DK and Rabbid Cranky's attacks and abilities, turning them into a furry wrecking ball of doom. One thing we left out of Donkey Kong's list of skills is his ability to pick stuff up and throw it at an enemy to cause damage. Donkey Kong can throw just about anything on the map, starting with cover positions; uproot a half- or full-cover and not only do you deny your enemies shelter, you lob the shelter on to their heads to damage them. Pack an extra punch by grabbing spring or fire covers and then throw them at enemies to trigger their super effect (bounce or burn) and deal extra damage. What about enemies? You bet! DK can pick them up and throw them at each other, or even hurl them off the map to do extra out of bounds damage. He can pick up allies too; increase Rabbid Peach’s range of motion by hoisting her up and heaving her across the map, or throw her sentry when it's out and about (Tip: Slab-wielding Bashers won't track towards DK if he throws a sentry at one of them and it explodes). Even Rabbid Cranky gets in on the action, and with his ability to shoot in mid-air, throwing that old geezer around can be quite an effective combo. You know those pesky Rabbid ears? The ones that come popping out of the ground and make your blood pressure skyrocket because you know you'll have to deal with a whole new set of enemies if you don't hurry up and complete the objective? Yeah, those. Donkey Kong can rip them out of the ground and throw the Rabbid attached to said ears at a foe. It doesn't remove them from the battle entirely, but it sure does feel good to take proactive measures against those ears. Mario + Rabbids Donkey Kong Adventure isn't all about using your bananas to bash the Rabbids. Like the original game, some parts of the world require you to use your brain to unlock secrets, but there are also some puzzle segments that block the main path. In one such instance, we encountered a collection of Tiki statues with facial expressions that had to be rearranged using environmental clues in order to proceed. Some of the battlegrounds in Donkey Kong Adventure have new features that can either help or hinder your progress toward restoring order. The helpers are the new ramps branded with a big "DK." Donkey Kong can use to them to leap from one ramp to the next, allowing him to cover great distances in a single turn (you can pretty much travel across the perimeter of an entire combat area, in some cases). And since he can carry a teammate during his turn, provided they're in range, he can take a buddy with him. This opens up new tactical possibilities for focusing damage on certain enemy types (like Bashers, for instance) before they become a problem during a battle, especially if you take Rabbid Cranky along for the ride. Other environmental objects aren't so friendly. In one of the earlier levels, our heroic trio encounters fountains that rotate and spew water in four directions at the end of each full turn, doling out damage and knocking characters out of position. While they can also damage enemies, these fountains will force you to think two or three steps ahead to ensure you're not in the wrong place at the wrong time. 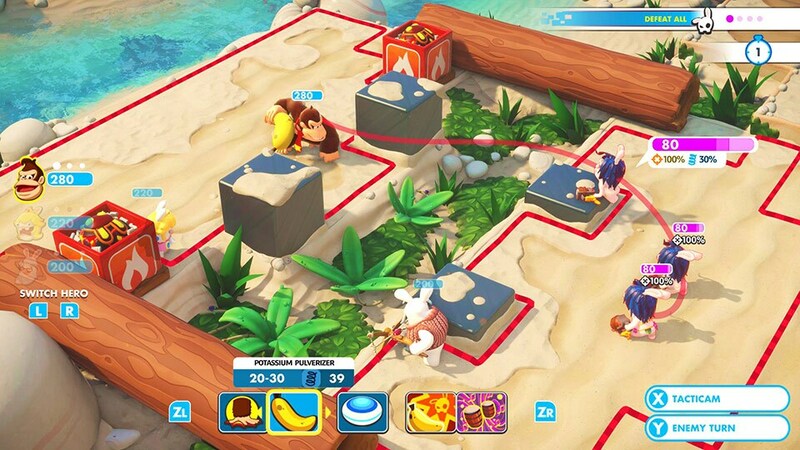 This only scratches the surface of Donkey Kong Adventure, which is coming soon to Mario + Rabbids Kingdom Battle on the Nintendo Switch and will be available as part of the Season Pass, as well as available for purchase separately.